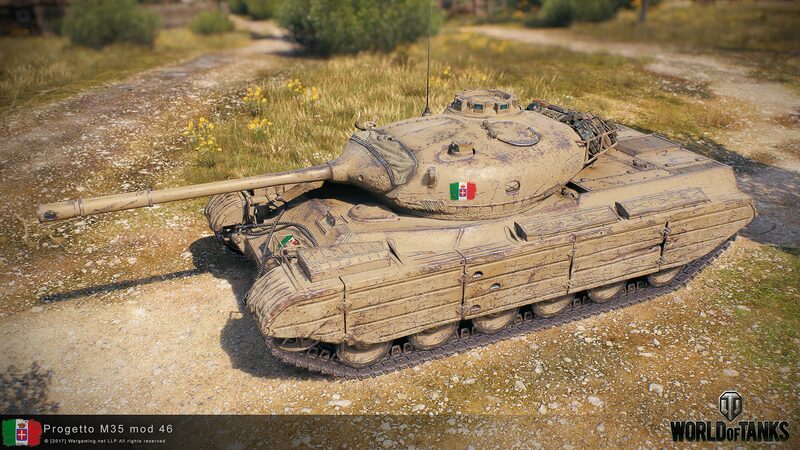 World of Tanks received an update today and with it, Italian Tier VIII medium tank Progetto M35 mod 46 got some nice changes. The tank was already handed out to Community Contributors to be tested, but no release date was announced yet. Dispersion on hull traverse (?) 0.20 0.16 -0.04 ? Dispersion on turret traverse (?) 0.13 0.10 -0.03 ? Traverse Speed (deg/s) 40 46 +6 ? Times of shells auto-reloading (s) 8.5/10/14 8/9/12 -0.5/-1/-2 ? Gun depression (deg) -8 -9 +1 ? That’s more like it. I think it is fine for the moment. Now the Standard Tier 8, 9 and 10 also need some changes, reload is too damn long on Tier 10. Morepowercreep. Make if better then normal reloading tanks, why not. But give him magazine just in case. Exactly, when you compare the gun on Progeto m35 and the gun on the t69 is like “ok,… WG”, like look at that gun handling and accuracy, good pen on ap aswell as on apcr, good mobility. Previous Entry Armored Warfare: Seasons are coming!